It’s now been 20 years since I developed the earliest software to perform cost estimating for electronic assembly. This early effort leads to my understanding of the importance of uptime and productivity in an assembly line. Subsequently, this work encouraged me to write the “Adventures of Patty and the Professor,” first as a series of blog posts which were then compiled into a book, published in two editions. While many have benefited from this effort, there remains much work to be done to spread the message. My colleagues and I still find electronics assembly lines with very poor uptime; most recently one with an uptime of only about 5 percent! So I will continue spreading the word. Let's go! Let’s assume a small electronics assembly shop exists, with a respectable line uptime of 30%. Sales are $10 million per year and profit is 4% or $400,000. Of the $10 million in sales, 90% or $9 million goes to pay for hardware, such as components, PWBs, connectors, and other hardware. So, $600K pays for fixed costs such as salaries, utilities, rent, etc. Let’s say that management, the engineers, and the operators work together to increase the uptime to 35%, a 5%-point increase. Many people would assume that the profits would increase by about 5%. However, this figure is way too low. Let's perform some simple calculations to see why. With the 5% uptime increase, production increases from $10 million to (35/30)*$10 million or $11.7 million. Subtracting the 90% cost of hardware yields $11.7M – $10.53M = $1.17M. Then, subtracting the fixed costs of $600K, this results in $1.17M - $0.6M = $567K in profits an increase of 41.7% over the initial $400K in profit!! 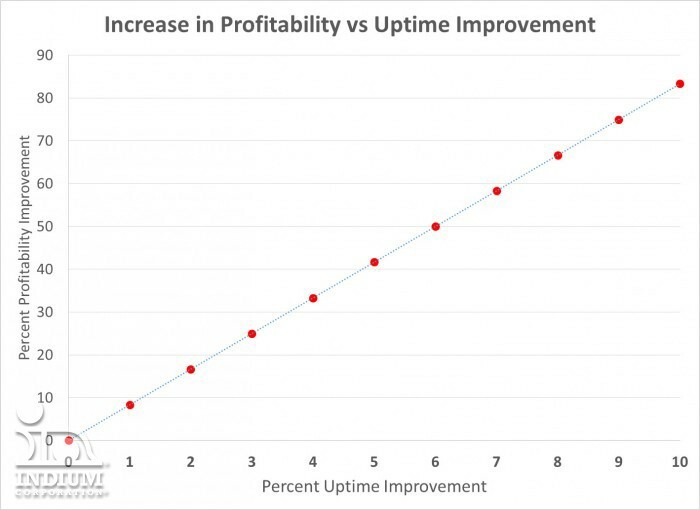 The profits as a percent of uptime increase are seen in the graph below. Figure 1. Even only a 1% increase in uptime, results in about a 9% increase in profits. This rapid growth in profit as a function of uptime is what I call the Law of Increasing Profits. A small increase in productivity results in a large increase in profitability. The reason being that the fixed costs (salaries, utilities, rent, etc.) remain essentially constant, so even a modest increase in production (i.e. sales) results in a large increase in profits. Uptime, and productivity in general, should be high on our list of concerns when we manufacture products. I pose as an axiom that uptime should be monitored and a continuous improvement plan for it should exist in all manufacturing operations. If you are interested in the "Adventures of Patty and the Professor" book that discusses productivity in a fun and informative way, it can be downloaded for free at this link.